I have been looking over some other games of late, just because I like to keep my toes wet and up to date with aspects of gameplay that make the gaming experience more fun for the player. And whether its because I am getting older, or just like a little more leniency in my game, I have decided to make two minor alterations to my original concept surrounding death. 1) Death by attrition will no longer occur. However, penalties to attack/damage will take its place. 2) Falling in combat does not necessarily mean instant "death". Especially as the player begins at first level in this campaign, I decided that a more forgiving system was called for, and so have adopted one that can be tailored to the player's preferences by the introduction of a few core gaming aspects that are governed by an in-game choice towards the start of the game. When the player is presented with the following GUI, they can take one other "gift" that alters the way the game plays for the player's PC. One combination allows the "death" system to play like the original campaign. i.e. As long as somebody survives a combat, then the fallen PCs will recover after the battle. Of course, there are still other combinations where death of a companion means death! Vol's Gifts - Choose Another or Not? 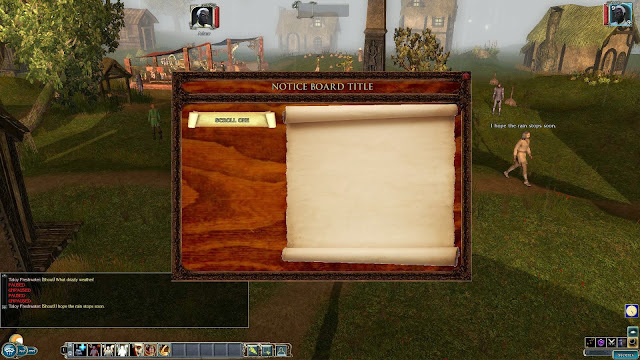 Many years ago now, I created a Notice Board system, which allows the player to click on the board and interact with the scrolls found thereon. The system worked reasonably well, but having come back to it after all this time, I have noticed that clicking on the individual scrolls can be "risky" in that a player may miss one if they are not careful. This, to me, was an unnecessary obstacle, and so I have now adopted a system similar to the one used in Dragon Age (which I have only recently started to look at). An aside: I was quite encouraged to see how Dragon Age played, and it reminded me quite a bit of my own style. So, anybody who likes Dragon Age, will hopefully enjoy my own campaign. The code is currently work in progress, but here is a screenshot showing the kind of thing to expect. Notice Board New Look - Work In Progress! Finally, I decided to change the colour scheme of the Main Menu this week, from black to a scroll background with complementing colours. Hopefully, readers will like the makeover. A screenshot is below. That's all to report this week, apart from saying that I have come up with a plot line that I am finally satisfied with for the last main dungeon I need to write up. That was a big obstacle, but now I have a focus for what to do, hopefully, it will flow more readily now.